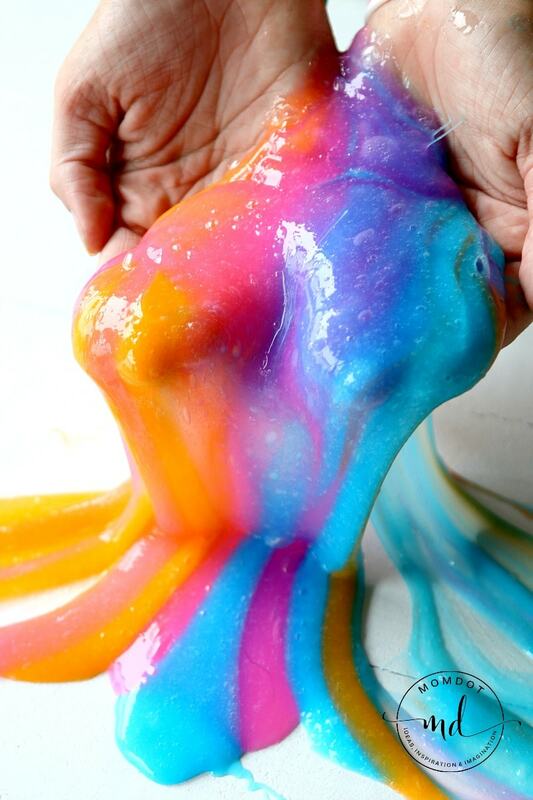 How to Make Slime; This is a Slime Manual – Everything you need to know to get slimed and have fun! It’s been a few years now on teaching people how to make slime and I have to say, I am still not done with slime! Every few days I find myself dragging out my jug of glue to see what new sort of gak, goop, slime, and sticky fun the kids and I can create. We love experimenting with colors, add-ins, and different slime recipes to explore new textures and slimy stuff! But not everyone knows how to make slime. If you haven’t given slime a try (and really, you should if you haven’t yet), consider this my slime-making manual – everything you need to know to how to make slime, make it semi-educational, and have a fun time with the kiddos. Before you know it, they’ll be back to school and those long summer days you didn’t know how to fill will be long behind you. So let’s grab what’s left of your summer and get some slime going. I made this video on how easy it is to make slime and demonstrate! While it was during Easter time and so we called it Easter Slime, this technique is used for ALL slimes. Also scroll down to see a video on Slime Mistakes and how to fix them. 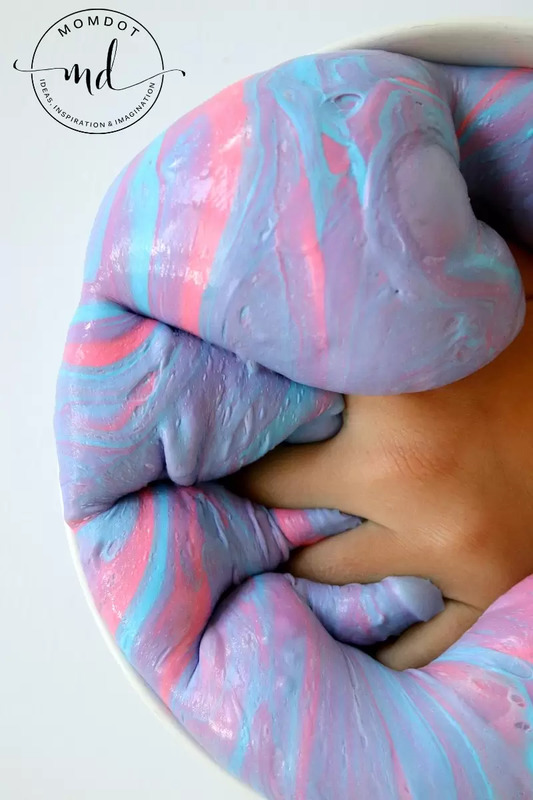 There are tons of different ways to make some awesome slime. I’ll talk more about the science behind how to make slime in a bit, but slime emerges when there is the correct ratio of polymers to borate ions. So, to make slime, you need both polymers and ions. Most recipes are based on a reaction between the polymers in glue and the borate ions in Borax , saline solution or starch. If you’ve wondered what everyone is doing with those gallon jugs of glue you’ve seen in the stores, this is it. While a jug of glue is generally enough to last several lifetimes, if you get on a slime kick, I strongly encourage you to go with the giant size container. You’ll be amazed how quickly you use up the little bottles, and bigger containers mean less waste. Good for you, your wallet, and the environment. Win! To make a basic slime that’s great for starting you need a few household tools and some key ingredients. I always use an old plastic bowl that I no longer use for cooking, a dollar store spatula, and a set of cheap and old mixing cups. Gather all the slime ingredients you need for your recipe. You’ll need some combination of glue, borax/starch/saline solution and sometimes water. I also like to add fun stuff like various food coloring to tint the slime (different colors mean the kids don’t argue about who has what) and even, if I’m feeling daring, glitter. 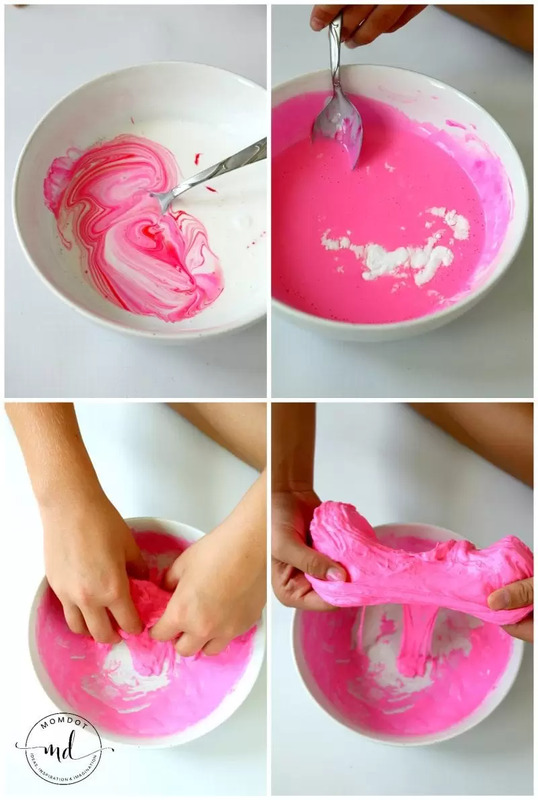 You can also make slime using glitter glues or just stick with plain old white or clear Elmer’s glue. Personally I like white glues because you just can’t beat it for the consistency and mixing properties (and price!). Kids can help with the measuring and mixing but a parent should be on hand to supervise and make sure all goes to plan. Mix thoroughly and immerse yourself in slime. Depending on the recipe, the slime may be done after a few days of usage or last a long time in a Tupperware. We have had some of our slimes last for months! I like to inject a little science into every kitchen dominating kid activity I undertake, and I think slime is one of the most fun and accessible lessons to teach kids, even if the chemistry is rather complex. However, it is WAY COOL when your kid can explain the chemistry to their friends; I’m not gonna lie. Slime is constructed of polymers combined with other ingredients that make these polymers stick together in some way. Polymers are long strands of molecules that lay together in smooth rows. This chemical makeup is why glue pours so wonderfully smooth, although it is much less wonderful when poured over your laptop, as happened to me today. When you add other ingredients, such as liquid starch or Borax, the polymers stick to each other and get bunched up. It’s these stuck together polymers that give slime its stretchy texture, rather than the more liquid state it appears in the bowl after mixing. When you leave the slime alone, the polymer molecules relax and line up again, letting the slime become more liquid. Substances with these properties are called non-Newtonian fluids which basically means they don’t behave like other fluids. At room temperature, slime can be mostly solid or mostly liquid, depending on whether you’re handling it or not. There are several different types of non-Newtonian fluids that are lots of fun to experiment with, but these tend to be messier than slime. My favorite alternative is cornstarch and water, which I personally can play with for hours, but which makes a colossal mess. For more on the properties of non-Newtonian fluids and the science behind slime, I strongly recommend reading this piece by Brian Rohrig. As with most things, slime projects are best undertaken with a bit of planning, supervision, and attention. First, depending on the age of your kiddos, you’ll want to at least be on hand for the measuring and mixing. For example, while my kids are ok measuring out the glue, I’d prefer to handle mixing chemicals such as Borax or liquid starch. Similarly, Mom handles the glitter at my house, but kids can help with the food coloring. Older kids can probably tackle more of the ingredients on their own. Kids of all ages can help with mixing as well, but it is faster if you just stir it up yourself- as with all kids crafts, ha! When complete, kids should have an easy to clean surface to play on, and I prefer to keep it off the carpet. Because yes, I’ve pulled little bits of dry and moist slime from my carpet fibers and it’s just not my favorite thing to do. When play time is finished, I give each kid a plastic zipper bag or mason jar to store their concoction until the next time. I find that hairs and lint and dust and whatever else become instantly enmeshed in the slime which is a little annoying, and depending on your perspective, a bit gross. Toss played out slime in the garbage can where it is out of the reach of pets and tiny little ones. Also, keep your eye on kids while they play. Pretty much any dough or slime activity at my house eventually turns into some sort of cooking play, and you have to really watch kids to be sure they aren’t tasting the slime. 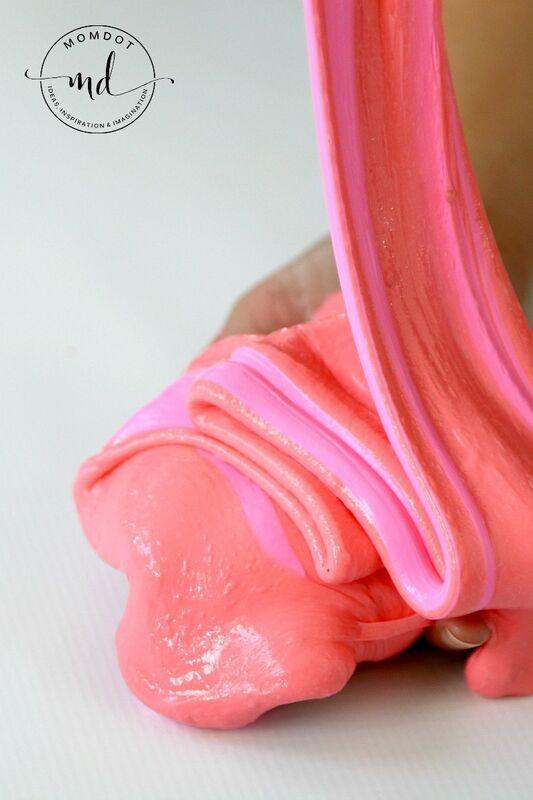 While there are edible slime ideas out there, I personally have not dove into any of them because I do not want my kids to mix up non-edible slime. I often struggle to sit on the floor and do imaginary play with my kids. It’s hard for me to slow down and let my inner child emerge, but when we pull out the slime, I can literally plunk down for long stretches just running the material through my fingers and experimenting with it. Personally one of my favorites is how to make sand slime… sand in slime is SO MUCH FUN! With some know how and a bit of supervision, you and your kids can get slimed, and create wonderful lasting memories in the fading days of summer vacation or any time of year. Looking for specific recipe ratios or slime ideas? 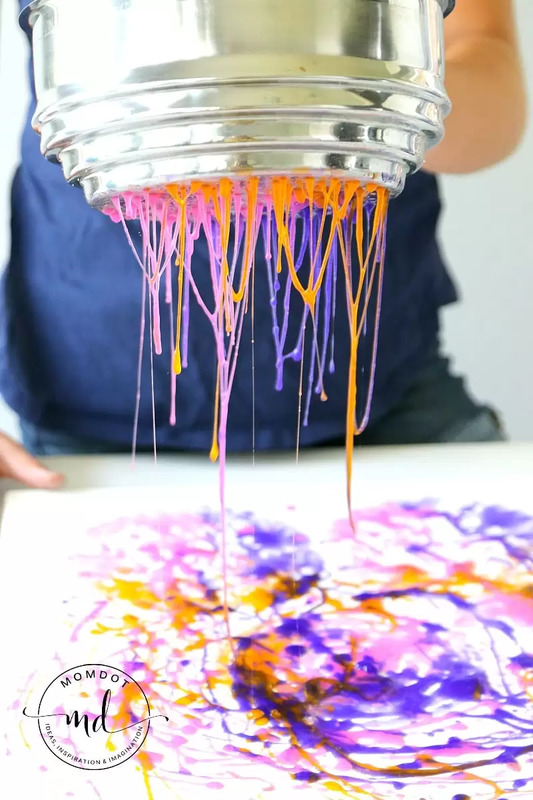 Make sure you try out Slime Painting, learn how to make crunchy slime, or even this Kinetic slime DIY recipe! Anyway you make slime is so much fun.